When I attend business events, unless I’m there to give a speech, I turn pretty shy. Because of that, I’ve forced myself to develop some effective strategies and methods I hope you find helpful. 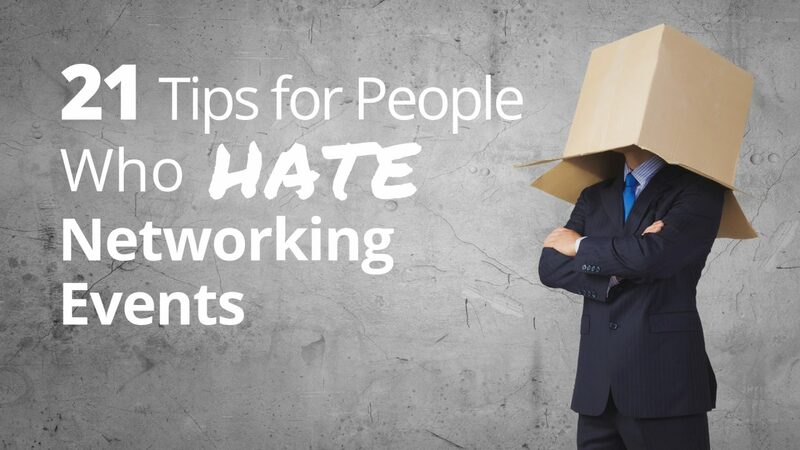 Hate Networking Events? Then try these 21 tips. Be a curious and unselfish listener. Manage distractions to make good eye contact. Manage interruptions. Stay focused and do your best to not let others interrupt meaningful conversations. Reconnect before you leave the event. Keep your word; follow up how and when you promised. Find the right group for your business. Talk about your business in terms of how you truly help others. Be crystal clear about who a good prospect is for you. Meet with members outside of the meetings – to really get to know each other and become more referable. Think in terms of giving and receiving quality introductions – not just leads. Give it at least 6 months. Sometimes your best referrals/introductions come when the members really get to know and trust you. Every group – be it an industry group or local business group – has what I refer to as Influencers. These are often the more successful members of the organization who have also taken on a leadership role at some point. These Influencers can be a great source of referrals for you – if they know who you are and how you benefit others. Determine who the Influencers are before the event. Do a little intelligence gathering on each of the Influencers you want to meet. Use others in the organization to introduce you to them, if you can. Find ways to be of value to them, either directly at the event or in other ways. Determine a what’s-in-it-for-them reason to stay in touch after the event. This entry was posted in Get More Referrals and tagged networking, networking events.